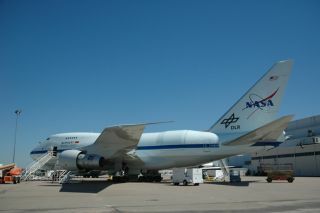 The Stratospheric Observatory for Infrared Astronomy (SOFIA) is rolled out after receiving its new paint job. After a brush withcancellation early this year, the U.S.-German SOFIA flying astronomical observatory has a newlease on life and a fresh paint job. But before the telescope-equipped jetlinercan begin initial science operations, NASA says it must first undergo severalyears of intensive flight testing. The Stratospheric Observatory forInfrared Astronomy (SOFIA), in development for the past decade, is slated totake to the skies for the first time this winter. The modified Boeing 747 [image]is due to make a series of brief checkout flights over Waco, Texas, beforedeparting by late February for its new home at NASA's Dryden Flight ResearchCenter north of Los Angeles. NASAintends to spend at least three years putting the SOFIA aircraft through itspaces before allowing researchers to use the flying observatory's German-suppliedinfrared telescope [image]for the first time. Observation time, however, is expected to be limited untilNASA completes another two years of flight testing and declares SOFIAoperational. Ray Taylor, the NASA programexecutive for SOFIA, said full-fledged science operations could begin as soonas 2012 assuming the final two years of shakedown flights go well. "The science phase comes later now,"Taylor said in an Oct. 12 interview. "In front of it is going to be moredevelopment time and more development funding." NASA has spent roughly $485 millionon SOFIA since awarding the prime contract for the project to Columbia,Md.-based Universities Space Research Association (USRA) in December 1996.Taylor said NASA expects to spend another $250 million to $350 million on SOFIAbefore declaring it operational sometime early in the next decade. Universities Space ResearchAssociation President David Black, who fought hard tosave SOFIA from cancellation earlier this year, said he was disappointed withhow NASA restructured the program. "We are disappointed that thesolution NASA has come up with is going to add extra cost and delay," saidBlack. "We are going to continue to work with NASA to see if we can help findways to pull that back." Black said estimates put forward bythe program late last year pegged the cost to complete SOFIA at $150 millionwith the first science flight slated for mid-2008. NASA officials, however, doubtedthose estimates and called for an independent program review in April 2006 to sort out what it wouldtake to finish and fly SOFIA, which was already over budget and several yearsbehind schedule. In February, well before that reviewhad even begun, NASA sent Congress a 2007 budget request that includedno money for SOFIA. The move, widely seen as a de facto cancellation, shockedastronomers and angered NASA's German partners. NASA came under immediatefire from SOFIA backers and their allies in Congress. NASA officials said they would hold off making a finaldecision about SOFIA until getting the results of the independent review. That review, headed by former DrydenFlight Research Center director Kenneth Szalai, wrapped up in late spring andfound no insurmountable technical or programmatic hurdles to completing SOFIA.NASA announced this summer SOFIA would be going forward but that responsibilityfor flight testing the aircraft would shift from Ames Research Center -- whichhas long managed the program -- to Dryden, the agency's primary flight testfacility. Black, who is stepping down as USRApresident in January, said he was glad SOFIA is going forward, but worries thatinserting Dryden into the program is driving up costs. "I think the reason it's going tocost more is that with two centers involved now there will be more civilservants involved in the program," he said. Black also questioned the lengthyseries of flight tests Dryden intends to conduct before declaring SOFIA operational. "Dryden is taking a veryconservative, perhaps unnecessarily so, approach to flight tests," Black said. "This is not an experimental aircraft." Black said previous plans called forleaving flight testing largely in the hands of SOFIA's builder, Waco,Texas-based L3 Communications and Integrated Systems, which was working closelywith the Federal Aviation Administration on a certification plan for SOFIA. Taylor said the lengthier flight testprogram now planned is warranted given SOFIA's relatively high operatingaltitude -- 39,000 to 45,000 feet (11,887 to 13,716 meters) -- and the fact thatthe aircraft's 8.8-foot (2.5-meter) telescope sits behind a large retractabledoor that must remain open during flight in order for the telescope to do itsjob. "This is the largest hole that hasever been put into the structure of a 747," Taylor said. Taylor said that Dryden has thenecessary expertise to test an aircraft like SOFIA. "We are in a new domainhere with the size of the aperture on the airplane." After arriving at Dryden, SOFIA willspend the remainder of 2007 conducting so-called door-closed flight tests. Eachtest is intended to take SOFIA closer to its operating altitude. "Because SOFIAflies at a very high altitude there is a lot of flight envelope to clear,"Taylor said. "That is why that phase of flight testing does take time." Starting in 2008, Taylor said, NASAplans to crack SOFIA's door open for the first time and see how it respondsunder various flight conditions. "Open door testing gets done by the end of2009," he said. "This has to be done very carefully in order for it to be donesafely. That's a big part of the program -- ensuring safety through all theseflight tests." If all goes well, Taylor said, NASAexpects to make some initial observations with the telescope starting in 2010as part of the final phases of flight testing. After this "engineering shakeoutphase," which Taylor expects to last "a couple of years," SOFIA could be deemedoperational with its flights dedicated to collecting science. Taylor was less specific on thequestion of when SOFIA might fly its first group of teachers, one of the longstanding goals for the program. "We don't have anything pinned down on that." Another question still to bedetermined, according to Taylor, is whether SOFIA stays at Dryden once declaredoperational, or moves back to Ames. "Science operations stay at Ames ResearchCenter pending an independent review on how to most cost effectively do scienceoperations," he said. "That independent review is planned for next year." Meanwhile, lawmakers who urged NASAto stick with SOFIA or at least give it a fair hearing before canceling it, arekeeping a close eye on how the restructured program plays out. An aide to one such lawmaker said itappears that the price of saving SOFIA was finding more work for Dryden, whichcould otherwise find itself with a dearth of flight testing to do in an era ofdeclining NASA aeronautics budgets. "This has become a jobs program forDryden to pay for a lot of uncovered work force," the aide said. "It's abargain with the devil: keep the program alive, but at additional cost andschedule." Taylor said he did not know how manycivil servants NASA had assigned to the program.